Nashville has been on my musical map ever since I founded my own band "Iron Hand" [click here to proceed to the website of the band] that plays New Country in 2012. I knew the city as a Mecca of Country music and as a place that spawned a number of outstanding pop/rock studio musicians who went on to play on records by huge artists such as Mark Knopfler, Eric Clapton and Toto.. 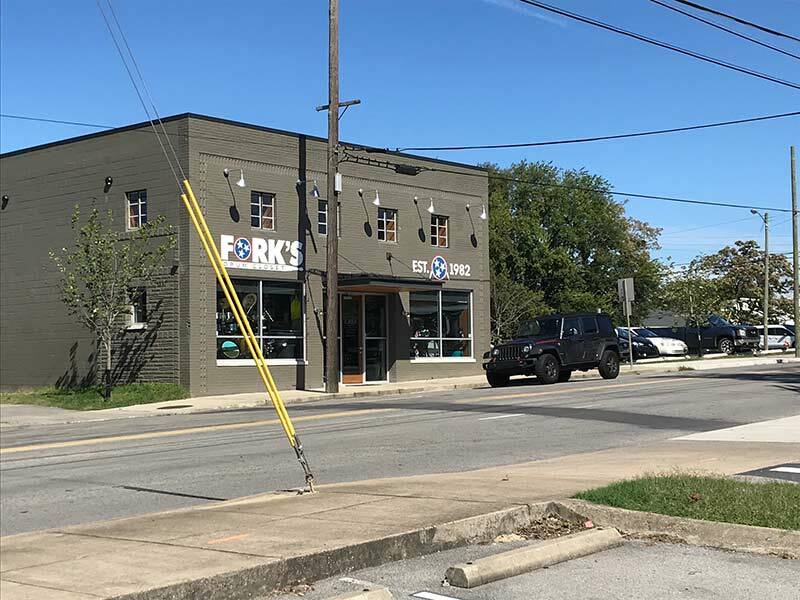 It was my interest in the New Country scene that has grown a lot in the last ten years and in the TV series Nashville that prompted me to travel to the capital of Tennessee this fall. 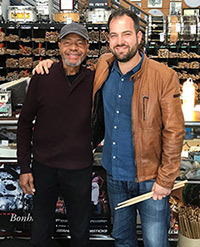 I wanted to listen to live music, visit the Musicians’ Hall Of Fame, meet the engineers who mixed our upcoming record … and then I realised that the huge number of world-class musicians that live in Nashville includes Chester Thompson and the less well-known but equally good drummer Nir Z.. I knew that Chester has been teaching at Belmont University since the mid 2000s, so I decided to write to him and ask for a drum lesson. Though I was aware that I would be able to understand and reproduce most of his technique and his style in playing without a lesson, I wanted to meet him, if it was at all possible. After all, Chester Thompson, along with Phil Collins, is one of my earliest and biggest influences on the drums. He replied to my e-mail within the hour saying that a lesson would be fine. When I asked him about a date and the price he also replied quickly and I confirmed both date and time. I did not get any replies from him after that, so that I received the final confirmation only when I already was in Nashville in October 2018. The lesson would take place at 10a.m. on a Friday, my penultimate day in the city. In order to make sure that I could make it on time I went to the drum store where Chester teaches a couple of days before the lesson. Fork’s Drum Closet is a fantastic drum store, and the staff are very friendly. They told me that Steve Jordan would come round for a free workshop in the store that Thursday at 6p.m. I had seen Steve Jordan play with Eric Clapton and John Mayer and I really appreciate his work. His teaching a workshop was a very rare event, as he is immensely in demand as a session drummer. I thought “wow, this is getting better by the minute” … and made sure to be there. Though Chester had snuck in to listen to his colleague Steve had noticed him. He asked him to sit at the drumkit next to him, and it was not long before these two exceptional drummers began to jam on a groove. When the Q&A continued one interesting question was: How did Steve manage to subordinate himself when he played with so many different artists who work in so many different styles. Steve replied, and I paraphrase: “If there is someone who can answer that question it is Chester who has accompanied a superstar for years who is himself one of the best and most famous drummers in the world.” Chester put it like this: “When I am on stage I listen and I subordinate myself to the music. It is not about having an opinion, but about supporting the song as best I can.” A highlight before my lesson, and I was looking forward to the other morning even more. On Friday morning I arrived shortly before the appointed hour and waited in a tiny room with two drums for the master. When he had not arrived at ten minutes after ten I wondered whether he had forgotten the date and whether I should have confirmed that date in person the night before. Then I remembered Phil’s wry statement from an interview where he said that “it would happen in Genesis that Chester was a bit late in the morning”. While I waited and wondered he suddenly appeared in front of my with a bag full of drum sticks. We sat down in the room, each at one of the drumkits. Chester is a quiet person, but very friendly. He asked where I came from, and I told him I was from Luxemburg but had been living in Munich for 16 years now. I added that I had attended one of his workshops there in 2003 and seen him play live three times with Phil and Genesis. He said “I love Munich. I love the English Garden.”. When I told him I had a university degree in drumming and learnt all his licks and fills by heart in the last 28 years he asked what I hoped to get from this lesson. I said that I would love to ask him a million things if he didn’t mind, and he replied “Okay, that’s fine but first I wanna hear you play.” I took my sticks and played him a simple beat with a few fill-ins, nothing too spectacular. I stopped after one or two minutes, and he paid me compliments about my sound and technique, which I found very flattering. I told him I had noticed in videos that he frequently used the French timpani technique (thumb on top, the stick turns by 90 degrees before it hits the skins) and he said he had stopped doing that twenty years ago when his thumb took the full force of the resistance in a rimshot (at a Genesis stadium gig) and left him in pain for a long time after. We talked a lot about drumming, Genesis and, of course, Phil Collins, who is my biggest role model by far. He told me some private details, and you could hear the immense respect he has for Phil Collins the drummer and musician. Chester was happy to see Phil touring again, and not at all surprised that Nicholas Collins drummed for him – he remembered that Nick had drummed incredibly well even when he was five years old. After a while he proceeded to teach me some independency exercises. He played an ostinato, i.e. a recurring rhythm, with his feet and added a rudiment exercise on the snare. This sounded simple but proved quite tricky to play – he had to laugh because I played it so unevenly. I promised to practice, and he said he would send me the exercises by e-mail (and he did, of course). I said I would of course be happier if they could adapt the dish to my taste. He smiled, shrugged and said: “You see? We are servants. We play for the music. 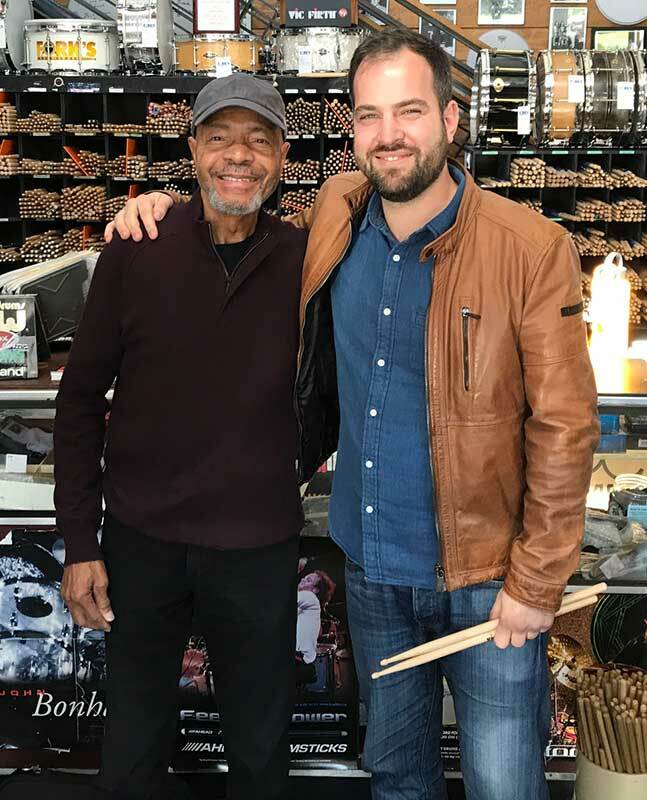 When the bandleader is the composer or the boss of the gig we play it the way the want it.” After the lesson we stayed in the shop for a while, checked out and tried some snares. There was time for a photo and we even exchanged phone numbers. When he was in Munich, he said, he might give me a call. Live-Doublealbum with guest musicians such as Chester Thompson, John Wetton and Ian McDonald.